Jane Kim, artist, science illustrator, and founder of Ink-Dwell, creates art to catalyze love, awareness, and protection of the natural world. Her Migrating Mural project is a series of murals painted along migration corridors shared by people and endangered animals. 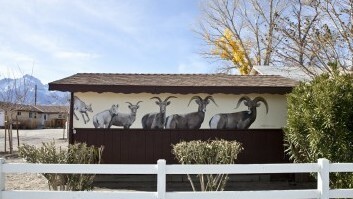 Jane has completed the first mural at the Mount Williamson Motel in Independence, CA! This mural tells an educational story, depicting the growth stages of a ram from a two-month-old lamb to an eight-year-old adult. The mural also incorporates the iconic profile of Mount Williamson, the home of one of the three surviving natural herds of Sierra bighorn. The project has already drawn a great deal of attention both in our community and in the national media, and we celebrated Jane’s achievement on February 16 with the fundraiser gala “500 and Rising.” Thanks to all the friends from near and far who came to show their support for Sierra bighorn. Jane will begin work on two murals in Bishop this April and June. We’re looking forward to watching the next stage of the Migrating Mural take shape.